At Carpet One Floor & Home, we are proud to be your local hardwood flooring retailer. In our showroom, we have hardwood of all types, stains, and species. With the vast number of choices, we are sure to have a hardwood floor you just can’t keep your eyes off of. Pair our collection of flooring with our sales professionals who will guide you through finding the hardwood that is best for your lifestyle and design, and you’ll quickly see why we’re your local experts! Investing in hardwood means investing in your future. Hardwood floors are built to last, so your investment is one that will endure the test of time. Hardwood adds classic charm to any home. If you want to transform your space while also getting a reliable floor, consider hardwood floors. 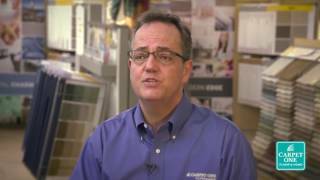 Join our very own Jim Aaron, VP of Merchandising for Carpet One Floor & Home, for some information on the all the different looks and style available in hardwood floors. Just like how there are many different types of trees; hardwood comes in different species as well. Because hardwood is milled directly from trees, when wood is taken from a different species, it is evident in its character, hardness, and color. Keep in mind; you will want to choose a hardwood that fits with your lifestyle, not just one that looks trendy. Solid hardwood is the most basic construction of flooring; it is milled in one continuous piece directly from trees. Grooves are added to allow for ease of installation, and solid hardwood can then be installed. One of the benefits of solid hardwood is that it can be refinished several times after wear becomes present. Refinishing solid hardwood makes it appear brand new in most cases, allowing homeowners to renew their home design on more than one occasion. Engineered hardwood is made from authentic wood pressed together in layers, each in different directions. This construction makes engineered hardwood sturdy and stable against traffic. The top layer of engineered hardwood is a piece of wood directly from a specific species of tree, showing off its character and charm. Solid and engineered hardwood floors are not the same, particularly when it comes to where they can be installed. Solid hardwood is recommended for low-moisture areas like bedrooms, living rooms, playrooms, and dining rooms. Engineered hardwood floors are a bit more versatile and can be installed anywhere solid wood can be installed, as well as in basements, finished attics, stairs, and hallways. Both solid and engineered hardwood are not recommended for bathrooms or kitchens. Like what you’ve heard so far? Come into our showroom in Bend, OR to speak with one of our experts or browse our wide selection. We even have some exclusive brands like Rustic River™ and Voyager™. Choosing the right hardwood is a huge decision that should be based on your lifestyle and activity levels. Find out more about the differences between hardwood varieties. Want to be sure that you’re selecting a floor that can be maintained? Check out our hardwood maintenance recommendations to ensure you know how to take care of hardwood.